Castleford Tigers half-back Ben Roberts has had his contract cancelled by mutual consent. 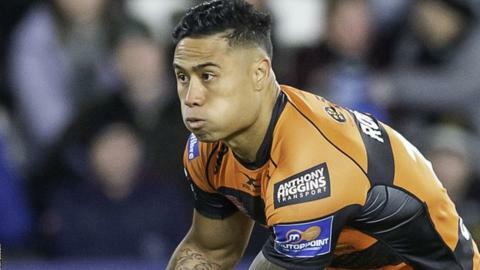 The 33-year-old Samoan and New Zealand international has struggled with injury this season and also fallen out of favour, playing just one of six Super League games so far. He joined Tigers in 2015 and made a total of 78 appearances. Director of Rugby Jon Wells told the club website Roberts should be "incredibly proud" of his contribution. "He played his part in re-positioning this club to where we are today. At his best, he was unplayable," Wells added. "In recent months, Ben's injury issues have meant he has struggled to reach a point of fitness and availability that would allow him a continued run in the matchday 17. "Following a series of long but amicable discussions, we have reached an agreement which works for both Ben and the club."